Energy saving posters and ideas for Going Green in the Workplace with 55 earth day slogans to use on posters to promote energy saving and greening our world. More employers than ever are aware of the environmental impact of the workplace. There are hazards in some industries, for example. However, even those businesses that don't deal with toxic chemicals might wish to promote a greener work environment, both for employee safety and to accomplish public outreach. 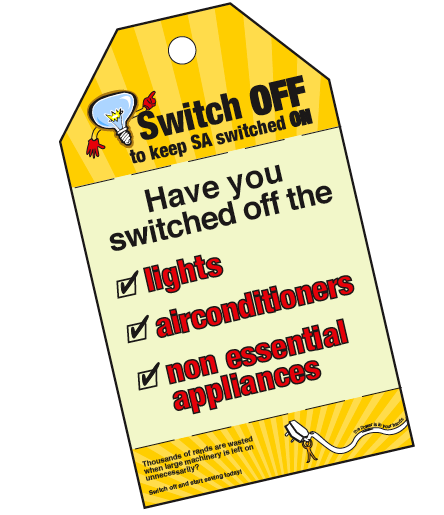 Using energy saving posters is a great way to communicate these goals to the people that you deal with on a day-to-day basis. (SA stands for South Africa). One of the main benefits that using posters has to do with awareness. Becoming more in tune with the environment begins with knowing what it means to each individual. Going green deals with reducing a person's direct impact on their surroundings and on the world as a whole. Being exposed to an educational poster on a regular basis can inspire your employee pool to take steps to live a greener life. Public relations make up a huge part of the promotion of your particular business. Using energy saving posters is a great way to let people know what you believe in, in a non-threatening way. Nobody wants something pushed on them, so this is ideal for promotional purposes and staff relations. A poster can help you promote renewable sources of energy that you are using, or highlight things like the United Nations sustainable development programs that you have implemented. In addition, you may wish to place posters that define non-renewable sources of energy and the better alternatives. As you can see, there are plenty of reasons to incorporate energy saving posters in the workplace. If your staff is aware that their safety is at the front of your mind, retention and morale is improved. You may also find that your example inspires even greater change outside the workplace.